Sakura is the Japanese cherry blossom, and the annual blossom festivals are just about three weeks away. In city parks throughout Japan, the cherry blossoms will resemble forests of pink clouds, and this visual treasure has inspired poets and artists to regard the sakura as an omen of good fortune, an emblem of love and a metaphor for the fleeting nature of life. 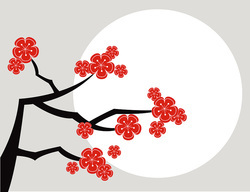 In fact, the Japanese expression “mono no a-ware” includes the concept of ‘empathy toward things’ as well as ‘the impermanence of things’, both associated with the Sakura. This year’s cherry blossom festival will include much ambivalence for the Japanese people, as well as many travellers who have explored the country and fallen in love with the people, the history, culture, the food and everything else that ‘is Japan’. For others, reflecting on the poetic impermanence of the cherry blossoms, the feeling may be more empathetic; that good times, reflected in the blooming of the Sakura, and bad times, symbolized by the fact the sakura will eventually fall to the ground or be dispersed in the wind and die, are part of the cycle of life. There is no negativity or regret in these feelings, it is more a positive projection that next spring, once again, the sakura will appear and put smiles on people’s faces and reaffirm that life goes on. From many other Issa poems, and of course personal one-on-one involvement in appreciating the sakura, we can all take comfort in the fact that Japan will recover with our help and support. The travel industry is ideally suited to contribute to the recovery by suggesting that travellers contact one of the many charitable organizations collecting money for shelter, medical supplies, clean water, food and clothing. These include www.humanitariancoaltion.com (founded by Care, Oxfam and Save the Children) or the Canadian Red Cross (www.redcross.ca), World Vision (www.worldvision.ca), Doctors without Borders (www.msf.ca), among others.